Yet I was never sure if my dad really did love me. He was an alcoholic. So was my mom. Between the fighting and the drinking and the jobs that he quit and the jobs that he lost and the constant moving, it was hard to know if my father really loved me. He died when I was 11 years old, leaving me feeling not just fatherless and not just unloved, but unlovable. God: Debbie, what do you believe about me? Me: I believe You are my Father, my Counselor, my Savior, my Friend, my Groom, my Teacher, my Helper…..
God: What do you believe about me as your father? To say I was shocked is an understatement! I said, Lord, I’ve never thought about You being my father. But as a father You would be good. You would teach me. You would discipline me. You would be proud of me. You would take joy in me. You would look down at me when I sleep and smile, like I did when my children were small. You would provide for my every need. You would never leave me alone. You would always do what was best for me. You would prepare for my future. Before I knew it, I’d spent hours that morning pondering what kind of father God is to me. When I finished writing it all out, something profound had changed in my heart. For perhaps the first time in my life, I did not feel unlovable and alone. I felt loved. I felt like the dearly loved, lavishly provided for daughter of the King. I have a Father who loves me, was all I could think about for days on end. May I ask you a question? 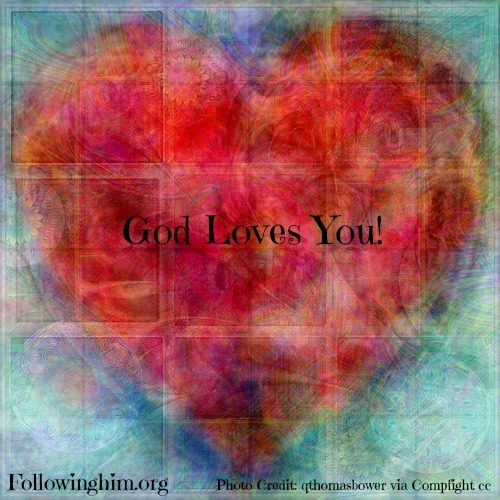 Do you know God loves you? Do you feel loved by Him? Do you know that He loves you as He loves Jesus? Sweet one, you are loved. You are God’s precious, loved daughter, just as Jesus is His precious, loved Son. You are loved unconditionally,as you are: the good, the bad and the ugly. How different would your life be if you believed that your Father loves you? Ephesians 1:4 says, “In love…..“, which begs for us to comprehend that all God does is “in love”. Oh for the sheer joy of it. All that He does is motivated by His love for us! If it is hard for you to believe that God loves you would you stop what you are doing right now and sing Jesus Loves Me like you mean it, like you know it, like you believe it. And if it takes singing it more than once to sing it like that, then sing it all day long if you have to! Precious friend, you are blessed, you are chosen, you are loved by your Father! Say it. Believe it. Live like it is true, because it is! Thank you, Chris. Appreciate you taking the time to comment! You know better than anyone, don’t you my dear friend, how much God loves us?! Thanks for posting. Beautifully said, Debbie. I love how we can see your heart for us through your words. Thank you for those kind words, Debbie. They mean so much to me. Expressing myself verbally has been my primary gift for so long and now God is challenging me to pour out His Truth in written form and I have no idea if I am “hitting the mark” or better hitting hearts. So thank you for taking the time to let me know how you feel!